Is Thomas Piketty’s Capital in the Twenty-First Century just a rehash of Marx’s Das Kapital? When Thomas Piketty’s book Capital hit U.S. markets this year the response was both surprising and predictable. Surprising because a 700 page tome on economics became a bestseller! On the other hand the responses were predictable. The book received adulation from the Left and disgust from the Right. The polarizing effect of this book is immediately evident if one glances at the ratings of the book on Amazon.com. Out of 718 reviews 406 are 5 star reviews and 175 are 1 star reviews (viewed on June 26, 2014). Interestingly, the mean-spirted nature of the reviews was just as newsworthy as the book itself. The content of these reviews didn’t add much to these titles (other than to flaunt the failures of socialism and demonize Piketty and liberals). The basic theme of these reviews was that Piketty’s book deserves a 1 star because it is pure Marxism. As one of the few people who has read Das Kapital and Marx’s other writings, I had to read Piketty’s book and find out for myself if it was just a rehash of Marx. In case you’re wondering, I read Marx for my comprehensive exams in graduate school, not because I’m a Marxist. I was assigned Marx’s works along with many other originals, including Adam Smith’s The Wealth of Nations. Luckily, I still have my notes from Das Kapital so I didn’t have to re-read it! Once was enough! It was a tough slog, but it was actually worth the effort. After reading it and the other original works it became patently clear that the simplistic tropes that are pervasive in popular culture do not do justice to the complex ideas of these influential thinkers. Unfortunately, the simplistic platitudes that are used to represent these complex ideas have proven useful to those with political and ideological agendas. Before comparing Piketty and Marx I think it will be useful to examine an underlying assumption found in most of the reviews: socialism, communism, and fascism are essentially the same. 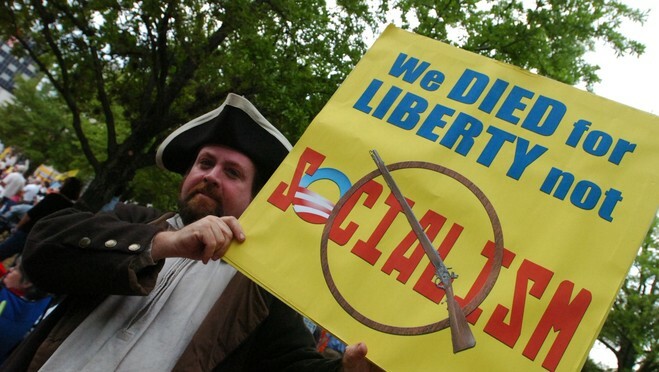 I was perplexed when I first saw this on some of the signs at the Tea Party rallies beginning in 2008. There may be some justification for lumping socialism and communism together, but “fascism”? I suspect this conflation is deliberately being used for political purposes, and while it has been an effective technique for those who use it, its results have been detrimental to our democracy. It has further polarized an already divided populace. It has also perpetuated a distorted and misleading view of history. Therefore, I think it’s worthwhile to sort out the distinctions between these terms. While socialism and communism are related, socialism is much broader in its meaning than communism. Most broadly socialism simply refers to a system or practice that advocates cooperation and equity over competition. Early socialism was a response to the horrors of the Industrial Revolution and the extreme individualism of liberalism. The early socialists envisioned a society that was more harmonious and equitable than the one they lived in. Charles Fourier (1772-1837) believed that small communities of about sixteen hundred people (phalansteries) were the solution. In these communities he envisioned everyone working at tasks they enjoyed. He rejected the idea of economic equality because he believed that those with special skills should be compensated accordingly. Another early socialist, Robert Owen (1771-1858), set up factories in Scotland that provided fair wages and housing to his employees to prove that high wages and profits were not incompatible. His factories attracted visitors from all over the world, but his experimental community in New Harmony, Indiana failed, mostly due to internal fighting. Marx called these early socialists “utopian” because they were not “scientific.” In contrast, he believed that his ideas were scientific because they were grounded in the laws of history. Marx also broke from these early socialists by emphasizing class warfare, which he saw as the driver of history as it inexorably marched toward its final phase: communism. The basic outlines of his “utopia” were laid out in the Communist Manifesto, which he co-wrote with Friedrich Engels. In it, they advocated a society with no private property and absolute economic equality. This final stage of history would usher in a peaceful and harmonious society in which the state would no longer be needed and thus would wither away. Marx believed that all the necessities of civilization would magically happen without a government because everyone would automatically cooperate to achieve collective ends. Talk about utopian! But at the time Marx was writing, the belief in anarchism as a solution to all the world’s ills was widespread, and Marx never questioned the assumption. Although the term “communism” was used before Marx, it is mostly associated with Marx’s theory and the Soviet Union. But the version that was implemented in the Soviet Union by Vladimir Lenin (called Marxism/Leninism) was not completely faithful to Marx’s ideas. This was partly because Lenin was faced with actually creating a communist society from scratch, based only on the broad outlines laid out by Marx. But the deviations were mostly the result of Lenin’s own proclivities. One of Lenin’s major deviations from Marx was his decision to impose communism from the top down rather than let it arise from the bottom through the actions of the working class (“the proletariat”). In addition, he chose his home country of Russia rather than the most advanced industrialized county that Marx predicted would lead the revolution. In the process of creating his communist utopia Lenin set two precedents that had profound consequences for the history of the Soviet Union. The establishment of an elite vanguard, and the reliance on the means of terror to achieve ideological and political ends, which he may have been intended to be temporary means to achieve his goals, calcified into the modus operandi of the Soviet Union. The legacy of violence that followed was born not just of Marxist ideology, but was also the result of Lenin’s absolute conviction that he was right and that any means were justified in the pursuit of his goals. The logical outcome of his convictions was terrorism. Once the Soviets began using violence against “enemies of the people” and “saboteurs” they were caught in a never ending cycle of violence and oppression in pursuit of a goal that was never fulfilled. This ensured that the Soviet Union would become a police state. So much for the state withering away. Rather than a communist society where everyone was equal (in terms of material goods) Lenin created a society with a small elite class at the top that ruled over the impoverished masses at the bottom. Because of the deviations from Marxist ideology, some argue that the Soviet Union was not Marxist. I think this point is debatable, but either way it is a mistake to associate moderate socialist (collective) solutions with communism or the tragic social experiment that was the Soviet Union. To associate “socialism” with the horrors of the Soviet Union may make sense politically for some groups, but it is simply preposterous hyperbole. Reasonable solutions to mitigate the harsh edges of capitalism bear no resemblance to the measures of the Soviet Union or other communist societies. If socialism is not communism, what about fascism? Associating socialism with fascism is a more difficult task than with communism. Fascists had a completely different vision of the ideal society than socialists or communists. “Fascism” is notoriously difficult to define, but even granting this it is hard to make the case that socialism is a form of fascism. Originally, as Adrian Lyttelto points out, “the word referred to a type of organization, the fasci di combattimento (combat groups), which gave its original name to the fascist movement, rather than to any complex of beliefs, like communism or conservatism.” This is what gave the movement its militaristic form and appearance. The ideological underpinnings that came to fill in this empty façade took shape afterwards in reaction to “disillusionment with the condition of civilization and society at a time of a seeming liberal ascendancy and at the dawn of a radical socialist alternative.” As a result fascism was anti-modern, anti-liberal, anti-communist, anti-capitalist, anti-intellectual, anti-individualism, and anti-democratic. If the movement was “anti” everything what did it stand for? What makes fascism so difficult to pin down is the distinctness of the various fascisms (Italian, German, Croatian, etc.) that sprung up. Because nationalism was at the heart of the fascist movements, each national group shaped its movement to fit its own unique national identity and history. Therefore, when using the term “fascism” it is important to note which fascism is being referred to. Given that most Americans associate the term with Nazi Germany I will focus on this fascist movement. Was there anything “socialist” in this fascist movement? One could argue that their anti-capitalist stance makes them socialist. But this is problematic given that the movement was anti-socialist and anti-communism not just in name but in practice. And if the term “socialism” simply means anti-capitalism it is stripped of its defining features, rendering it virtually useless as a term. In addition the history of the Nazi movement makes it difficult to render compatible with socialism. After the Bolshevik Revolution and several attempted, and one successful communist coups in Germany the fear of communism became very real. The Nazis successfully capitalized on that fear. In the 1930s, before Hitler’s appointment as chancellor but while he was head of the party, there were frequent clashes between Nazi “brownshirts” and communists in the streets. Hitler was able to use Nazi antipathy towards communists as part of his propaganda campaign, in which he presented himself as a bulwark against communism. This was not just a cynical ploy in the pursuit of power; Hitler’s antipathy toward communism was real. He hated its materialism, its universalism, and its emphasis on class conflict. And Hitler never had any desire to put all Germans on the same level economically, instead he stressed unity despite class differences. He also showed nothing but contempt for the popular Social Democratic Party of Germany (SPD). Hitler had no socialist or communist agendas in name or practice. If so, why does the association of fascism with socialism seem credible to so many? I believe that three lines of evidence have made the “Nazis as socialists” claim appear credible. However, the evidence is deceptive and on closer examination the claim falls apart. First, some claim that state-control of companies proves that the Nazis were socialist. However, this fact alone does not make the regime socialist. The fact that they allowed private property, and undertook this action to ensure that the companies served the wishes of the state and not to achieve socialist ends, undermines any claim that it was a socialist action. Second, and probably the most convincing piece of evidence to a lay audience comes from the full appellation of the Nazi Party: National Socialist Worker’s Party (or more popularly the National Socialists). The persuasiveness of this assumption was apparent in the Piketty reviews. For example, one of the reviewers claimed that Piketty’s book was “Socialist propaganda” and asserted that “Socialism has never worked and never will. Research National Socialist party.” While it seems logical that the Nazis would be socialist since the term appears in their name, this is not necessarily true. There were some socialist elements in the original party before Hitler took it over, but what determines whether or not it was socialist is what the party did and said when it came to power, and by this measure they were definitely not socialist. If labels were indicative of a group’s character then the People’s Republic of China, the Democratic Republic of North Korea, and the Democratic Republic of the Congo are democracies! The final line of evidence comes from the totalitarian paradigm that was popular in the aftermath of World War II. Its popularity during the Cold War has entrenched an association between the Nazis and the Soviets in the mind of many Americans. The totalitarian model rests on the assumption that the two great evil regimes of the twentieth century (the Nazis and the Soviets) were essentially the same. On the surface they did share some important similarities, but any comparison of the two regimes reveals that these similarities were superficial and masked their profound differences. Like a religion, the totalitarian ideology provides its adherents with beliefs that make society and history intelligible, that explain all of existence in an emotionally gratifying way. Again like a religion, it creates true believers, who feel that they are participating in a great cause—a heroic fight against evil—that gives meaning to their lives. Finally, they both sought to obtain complete control over individuals in every aspect of their lives, hence “totalitarian.” The subjects of these regimes were required to be true believers, and live every aspect of their lives in conformity with the stated ideological goals. Obedience, loyalty, and true belief were demanded by both regimes. Despite these similarities, the totalitarian model has served more to obscure rather than illuminate. The above resemblances make it appear that the systems are alike, but when they are compared beyond superficial appearances their similarities disappear. In the first major undertaking to compare the regimes in substance and actual practice, the results were so striking that the editor of Beyond Totalitarianism, Michael Geyer, declared that the two societies and regimes may as well have hailed from different worlds.” He wondered “how two regimes that in many ways look so similar can be so fundamentally different?” It turns out that the content of their distinct ideologies matter. Their contradictory ideologies cannot be reconciled. Their distinct visions were apparent to those living in those societies, and was the source of their deep animosity towards each other. They were bitter rivals, not totalitarian buddies. Any serious examination of the evidence undermines the claim that “socialism is fascism.” Despite this, it is unlikely that the association will be abandoned any time soon, because it serves important political and ideological goals. Those who desire the implementation of only pure free-market solutions in every aspect of society find the claim useful because it automatically delegitimizes any other solution. If socialism is communist or fascism then anything deemed “socialist” must be rejected out of hand as evil. Now that we have clarified our terms we can return to the original question: Is Piketty a Marxist? While Piketty tests and confirms Marx’s basic claim that “the dynamics of private capital accumulation inevitably lead to the concentration of wealth in ever fewer hands” (1), how he goes about testing this claim and his solution to the problem is very different. When Marx wrote Das Kapital economics was in its infancy and he was therefore limited in his data and methodology. In contrast, Piketty had access to three centuries of data from more than twenty countries (1), in addition to the collective knowledge of the hundreds of economists who came before him. Whereas Marx was rabidly anti-capitalistic, Piketty accepts the basic tenets of capitalism and only desires to mitigate some of its negative consequences. Whereas Marx believed that violent revolution was the solution, Piketty recommends a global tax. Does this makes him a Marxist? Hardly. Piketty’s primary claim in the book is that “inherited wealth grows faster than output and income,” (26) which he represents with the formula r > g (where g = growth rate or “annual increase in income or output” and r = “average annual rate of return on capital, including profits, dividends, interest, rents, and other income from capital, expressed as a percentage of its total value”). (25) While this is an affirmation of Marx’s fundamental claim, Piketty insists that his “conclusions are less apocalyptic than those implied by Marx’s principle of infinite accumulation and perpetual divergence [forces pushing toward greater inequality].” (27) This by itself does not make Piketty a Marxist. What about his solution? He unequivocally rejects Marx’s solution of violent revolution. Instead he recommends a global tax on capital because it would be the most effective solution in the era of globalization, when capital can be taken offshore in an effort to dodge national taxes. He admits that this solution is “utopian,” and is very unlikely to happen, but justifies his recommendation as a useful reference point. (471 and 516) More realistically, it will be at the national level, if at all, that any solution will take place. Here he argues in favor of a progressive tax because it is “a relatively liberal [in its original meaning] method for reducing inequality” while keeping the benefits of “free competition and private property.” (505) While this solution may appear Marxist to some, it is not a Marxist or communist solution at all. If he rejects all the major tenets of Marxism, how could he be a Marxist? Piketty has no desire to abolish private property. Piketty is not calling for violent revolution. Piketty is not advocating absolute economic equality. Piketty rejects the historical determinism of Marx. Piketty does not believe that it would be achievable or desirable for the state to wither away. Piketty does not reject capitalism. Despite the claims of the 1 star reviewers Piketty is not a Marxist, communist or fascist. And while he is in favor of some social programs it does not follow from this that he is anti-capital (he’s clearly not). Nor do any of the implications based on the conflation of the terms “socialism,” “communism,” or “fascism” follow from his proposed solutions. The extreme ideas and practices of the Nazis and the Soviets are so far removed from the practical solutions proposed by Piketty that it is absurd to put them in the same category. While he could be called “socialist” (depending on how it was defined) it would be more accurate to call him a pragmatist because he seeks socialist solutions in some cases and capitalist solutions in others. We should all strive to be practical rather than doggedly ideological. No ideology, including capitalism, is perfect, and to rigidly impose it on the world without concern for the consequences is not only cruel but it prevents us from solving our problems. To say that private ownership and competition are the solution to every problem is nonsense, and is belied by the facts. Something that works in one situation rarely works in all situations. Let’s take from socialism what works and let’s take from capitalism what works, and this is exactly what Piketty is attempting to do. Even if it is wrong in some of the details it is his approach that we should welcome. And more importantly even if you disagree with him there is no reason to demonize him or any other person or group. No good has ever come from such rhetoric (a review of the twentieth century should make this starkly clear). It serves no purpose other than to spread hate with all the consequences such hate engenders. After an article was published in the Financial Times story by Chris Giles (May 23, 2014) the 1 star comments shifted to point out this article as proof that Piketty is a liar and cheat. Giles claims that there were errors in Piketty’s data. However, Giles’ claims are probably not as damaging as he claimed, and there is no indication that Piketty fudged the numbers. There has been a lot of discussion on this issue, but Scott Winship of the conservative Manhattan Institute for Policy Research, who has been critical of Piketty for different reasons, gives a sober and balanced assessment of this issue. As Winship points out there were some legitimate concerns expressed by Giles (all scholarly work faces criticism unless it’s boring and no one reads it) but it and the responses to it appear to be more like an over-the-top attack based on an ideological hatred of all things not free-market capitalism. Read the debate and decide for yourself. Adrian Lyttelton, “What is Fascism?”New York Review of Books, Volume 51, Number 16, October 21, 2004. Aristotle A. Kallis, “Fascism,” in Europe Since 1914: Encyclopedia of the Age of War and Reconstruction, edited by John Merriman and Jay Winter, Vol. 2 (Detroit: Charles Scribner’s Sons, 2006). Marvin Perry, Sources of the Western Tradition: From the Renaissance to the Present, Vol. II, Brief Edition (Boston: Houghton Mifflin Company, 2006), 190. A successful two week reign of the German Communist Party in Munich was violently crushed in May 1919. Yes, he was appointed not elected (Gellately, Lenin, Stalin, and Hitler,209-11). I’m not sure why so many people believe that he was elected but I hear it all the time. see Gerald L. McCallister, “Fascism and National Socialism” in 21st Century Political Science: A Reference Handbook (Thousand Oaks: Sage Publications, 2011). Perry, Sources of the Western Tradition, 191. Michael Geyer and Sheila Fitzpatrick, Beyond Totalitarianism: Stalinism and Nazism Compared (2009), 21.